I'm going to post a sugar trading update on my last sugar futures trade. Today's futures blog entry is follow up for my 2012-09-20 Sugar trading blog entry, which you can view by clicking the link. Basically, I had entered into a long position in the March 2013 contract of sugar on Sept 20, 2012. My entry price was 19.88. The idea behind the trade was that my fundamental data was indicating that I should be looking for an entry opportunity. I had been looking and waiting for that opportunity for about a month and a half. 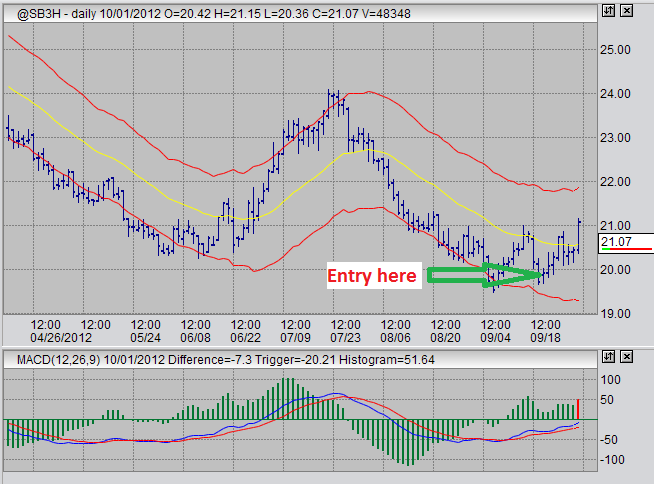 Finally, it presented itself Sept 20th in the form of an MACD divergence on both the daily and 60 minute charts. I entered, have been positioned long in that trade since. I have been using a very loose trailing stop, around 1.00, and I won't exit until I see some type of topping action with MACD or until my loose trailing stop loss order is triggered. Lets look at the daily sugar futures chart, for March 2013, as of today's close. The green arrow is pointing at my entry point. I got a big boost in confidence today, because as we can see prices made new highs. Not only did they make new highs, but they closed above previous highs. This is an excellent indication that I'm on the right side of the trade here, and since I got in fairly cheaply, I've already seen some benefit. The fact that MACD remains relatively low tells me there is a lot of room on the upside for price gains. I am quite happy with my position, and with the indicators the market is giving me on the daily time frame. In short, what I see is that I should now shift my attention to watching out for an exit and to watching out for opportunities to add to my current position. Adding opportunities may present themselves on the 60 minute time frame. Let us observe the 60 minute time frame trading chart for this soft futures product. Here we can see that no MACD divergence top is upon us. Beware, this could change on a dime, that is why I have a stop loss on order. However, for the moment, it appears as though the market will continue upwards. Opportunities to add to my long position may present themselves as price touches down on the moving average (yellow) on my 60 minute trading charts. Alternatively, if an MACD divergence top does occur in the 60 minute time frame, I will likely exit my position entirely and possibly re-enter on an MACD divergence entry signal within a very short time (a few days). This happens all the time, and on a daily chart it would lookin like prices dropping and then bouncing of the daily time frame moving average. In fact, I expect this will happen at some point in the sugar market rally. If the rally does in fact play out. Anyways, in other markets, I am still waiting for gold to return near the moving average I have set on my weekly chart. I am casually watching the USDX. I am casually watching natural gas, but only on the 60 minute charts.